Today, April 15th 2015, Cardigan Castle will open to the public after alot of work preparing the site. 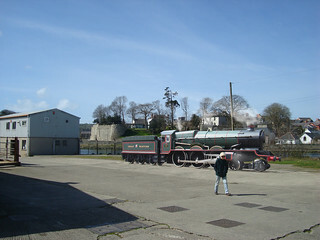 GWR Castle Class steam locomotive 4087 ‘Cardigan Castle’ is on-hand on the ‘Cardi-Bach’ heritage railway across the river from it’s stone namesake. OK, so the stuff about the steam loco and heritage railway isn’t true (well, it is April, even though I missed the 1st by some margin), but that’s what the image, which I’ve produced using Photoshop to mark the occasion, is meant to represent. The image is wrong for many reasons, which I won’t list here (feel free to have a go yourself, but you’d be better off commenting on the photo on Flickr as I’ve loads of spam comments to clear up on here), but in this case, do many wrongs make a right? On a more-serious note, the local newspaper is stating a prediction of 33,000 visitors to the (stone) castle in its first year. I make that 90 per day on average, or getting on for 8x the population of Cardigan; alot of extra traffic on the roads if they come by car. If they come by bus, that’s equivelent to two full buses, with a few standees on each. There is, of course, not really a railway link to Cardigan anymore, so the train won’t be taking the strain in this case.